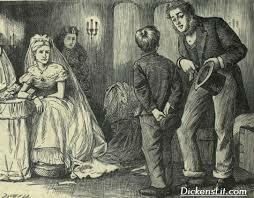 Great Expectations is the thirteenth and probably the most complex novel written by Charles Dickens. 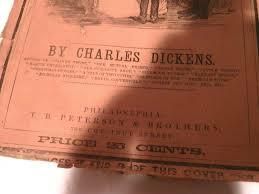 The novel was first published in 1860 in the form of a serial and in 1861, the complete novel came out as one part. The ending of the novel was re-written by Dickens in the book version after the demand of the publishers, which resulted in the novel getting more popular. What does Miss Havisham represent? Pip is the protagonist of the novel, who is an orphan and lives with his sister and her husband. The novel opens with Pip sitting near the tombstones of his parents when a criminal on the run emerges and demands food and a file for his leg iron from Pip. He arranges the things for the convict, but he is caught. The convict saves Pip by claiming that he has stolen the things. Pip leaves and goes back to where he lives. One day, Pip visits the house of the rich Miss Havisham with his uncle. She is a strange middle-aged woman who always wears a wedding dress. Pip also notices that all the clocks in her house have been stopped at the same time. At her house, Pip meets Estella, a young and beautiful woman. She is cold towards Pip, but he falls in love with her and expects that Miss Havisham will provide her financial support so that he can become a rich man and marry Estella. Pip continues to visit her house but Miss Havisham only offers him a job as a laborer. However, Pip works hard and manages to work with his brother in law who is a blacksmith as an apprentice. However unhappy, Pip works hard to fund his education. One day, his sister is attacked and is rendered a mute invalid, which Pip guesses are the doing of Orlick, another laborer working there. While working there, Pip gets to know that a rich benefactor has sponsored his education and he has to go to London for it. He assumes that Miss Havisham has done the favor on him as she wishes to marry Estella with him. In London, Pip makes new friends and forgets his old life, except for the dream of marrying Estella. He also becomes close friends with Herbert and they both start living a luxurious life by taking loans from various sources. Orlick appears again as a porter for Miss Havisham, but Pip reveals his misdeeds and he is sent back. Meanwhile, his sister dies who he visits but spends most of the time in London. One day, the convict visits Pip in London and reveals that he has financed Pip’s education because he was touched by his kindness. Pip is moved and decides to help him in escaping from London, where he is still a convict. Besides the police, his old partner is also looking for him. With this information, Pip also gets to know that his partner is the man who abandoned Miss Havisham after promising to marry her and Estella is the daughter of the convict and Miss Havisham. Miss Havisham was heartbroken after her abandonment and had raised Estella as a woman who would do the same to other men. Pip feels sad but devotes his life to help the convict escape. In the meantime, Estella marries a rich man and Pip visits Miss Havisham. By now, she is repenting her behavior and asks for his forgiveness. But the same day, her dress catches fire and she is left an invalid after the accident. Pip finally prepares for the day when the convict escapes. However, before that, he goes to a meeting and finds Orlick there who wants to take his revenge from Pip. He is about to kill Pip but Herbert comes and saves him. Pip hurries back to conduct the escape through a boat. But police and his partner arrive and they start fighting. The partner drowns during the fight and the convict is arrested and sentenced. Pip is again left with no finances and falls ill. During his sickness, he gets to know that Orlick is in jail after robbing his employer. Miss Havisham also dies and when Pip gets better, he goes home to marry, only to find that the girl has already married someone else. Pip leaves the country with Herbert and starts a business. Upon his return, he meets Estella, who is now a widow. He notices her sadness and calmness and leaves with her, hand in and, hoping to be with her for the rest of his life. 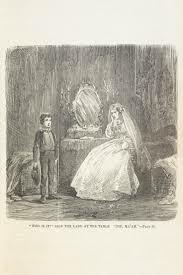 Great Expectations discusses a number of social and human concerns that the people in the Victorian society at the times of Dickens were struggling with. Like most of his works, class struggle is a major theme that has been discussed in the novel. 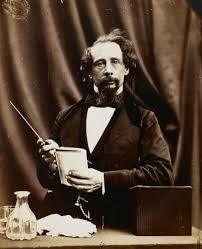 Through the character of Pip and his ambition to win the hand of Estella by becoming a rich man, Dickens has discussed the superficial nature of the English society. The pursuit of improvement and ambition for oneself is another idea that forms the underlining theme of the novel. However, it is closely related to the idea of growth in terms of class, it emerges as a separate idea of its own in the character of Pip. His struggle to become a rich man might seem shallow but plays a prominent role in establishing his character in the novel. Crime and innocence also act as an important theme that helps in the development of the plot of the novel. Almost all the characters of the novel are involved in some crime or the other at more than one time. However, it is not crime that defines these characters but their true nature, which is good and positive. The convict and Pip have been the main characters who have been developed by Dickens in such a way that the reader is compelled to feel sorry for their state, even though they have been involved in criminal activities. Though not the most important, Miss Havisham is probably one of the most intriguing characters in the novel. She possesses an air of mystery and eeriness about her and this is probably the reason why she is the most interesting character. When she is introduced, it is told that Miss Havisham is a woman who always wears a wedding dress. Besides, she has also stopped all the clocks of her house at one specific time. This presents her in a very strange light and the reader is intrigued by her behavior. Her desire to freeze the time at one moment arouses curiosity about what must have happened to her. As the novel progresses, she is seen as an aggressive and revengeful woman. She even trains her daughter Estella to grow up into a woman who finds contentment in breaking the hearts of young men. But as the reader gets to know her better, they realize her struggles and the reasons for her eccentric behavior. Towards the end, Miss Havisham is a completely changed woman who feels sorry for her behavior. She realizes that the way in which she has been treating people is not correct, even though she can justify it with respect to the tragedy of her own life. As she starts to repent her behavior and ask for forgiveness from Pip following her accident, it is natural for the reader to feel pity for her. Miss Havisham is the perfect personification of the social conditions of England during Dickens’ time. She wears a wedding dress which symbolizes the fact that for women in that era, marriage was the ultimate goal of life. Because her marriage could not happen, she is stuck in that time and is making deliberate efforts to stop it. She also represents the shallowness of the upper-class society of England of those times. Just because she belongs to the rich section of the society, she does not feel any guilt in being mean to poor people like Pip. She is indifferent of their feelings and finds pleasure in tormenting them emotionally. Inspired by the character of Miss Havisham in the novel, the famous Scottish poet Carol Ann Duffy has written a poem titled Havisham. The poem was written in 1993 and discusses the mental and emotional condition of Miss Havisham. It discusses the way in which she was left at the altar and still roams about as a bride and the impact that the event has had on her psychological state. The poem Havisham is a part of the series of poems in which Duffy has presented the emotions and feelings of a number of female characters in the first person. In this poem, the bitter and old Miss Havisham is full of anger for her former lover and discusses the state in which she is after he has left her. The poem is full of violent imagery and represents the twisted person that Miss Havisham has become as an old woman.